Interestingly Mysterious: How ISKCON got a foothold in Soviet Union? The popular story borders on fantasy or may actually be a figment of imagination. It narrates how Srila Prabhupada coincidentally met the right guy and how this guy single handedly introduced Hinduism to Soviet Union. I don’t buy it. I think there was a bit of behind-the-scene work by Indian intelligence agencies. They must have identified the young man and indoctrinated him. India’s intelligence agencies must have done this to cement the relationship between India and Soviet Union. And there are instances where Russian authorities 'surprisingly' gave permission to build temple or do something publicly. The reality may be that they must have demanded some bribe and their demands may have been fulfilled. Anyway below is the copy-paste lest they take down the website. It was early evening on July 11, 1972. Chess enthusiasts filled a sports arena in Reykjavik, Iceland, while millions watched on TV and listened on the radio. In what was dubbed “the match of the century,” Bobby Fischer challenged Boris Spassky, the Russian world chess champion, for the title, knowing full well that emerging victorious would have implications in the Cold War world. 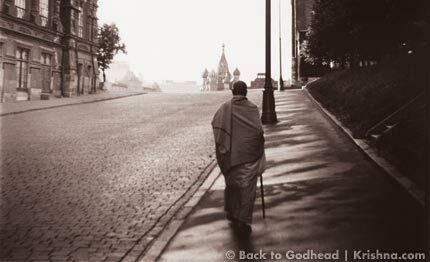 Just one year earlier, Srila Prabhupada had been strategizing to bring God into a godless Soviet Russia. If we think of Prabhupada's quest as a sort of chess match, it would have seemed that he had few pieces on the board, while the Soviets had the most powerful pieces and key squares blocked. But even one pawn or knight backed by the most powerful king and queen may sometimes checkmate castle fortresses and brilliant strategists. Thus, the story of Prabhupada's victory eclipses that of the World Chess Championship of 1972. Srila Prabhupada had initially tried to come to the USSR as an official representative of India, writing a letter proclaiming his intent to the Ministry of Culture. But he was denied entrance without explanation. Finally, after several attempts, he was given a tourist visa that granted him a short stay, even if he was not allowed to lecture at Moscow University. The lecture had been one of his reasons for wanting to visit. But by 1980, under Brezhnev’s rule, several devotees were thrown into prison, initiating a tense and often traumatic relationship between ISKCON and the Soviet Union. Such pronouncements, and the sentiments that fueled them, led to intense persecution of Hare Krishna devotees. And so, with ISKCON declared one of the great threats to the Soviet nation, an ongoing battle ensued. But this was no Fischer versus Spassky—two equal adversaries pitted against each other. This was a war conducted by a totalitarian state against a relatively small number of Krishna devotees. Consequently, dozens of ISKCON’s new Soviet faithful were thrown into prisons, labor camps, and psychiatric hospitals, suffering vicious mistreatment at the hands of police and political yes-men. Several devotees died in prison, clinging tightly to their faith while being tortured in various ways. Harikesha Swami, then ISKCON's governing body commissioner for the Soviet Union, would not stand for such horrors. A driving force for reform, he made the tragedy a worldwide concern. Kirtiraja Dasa had been ISKCON's regional secretary for the Soviet Union since 1979. He began an international campaign of news releases and demonstrations to pressure Soviet authorities to release the imprisoned devotees and stop the persecution of the Hare Krishna movement. To carry out this work, he founded the Committee to Free Soviet Hare Krishnas. Supportive voices were heard at the Reagan-Gorbachev summit in Reykjavik, at the United Nations, and in international newspapers. 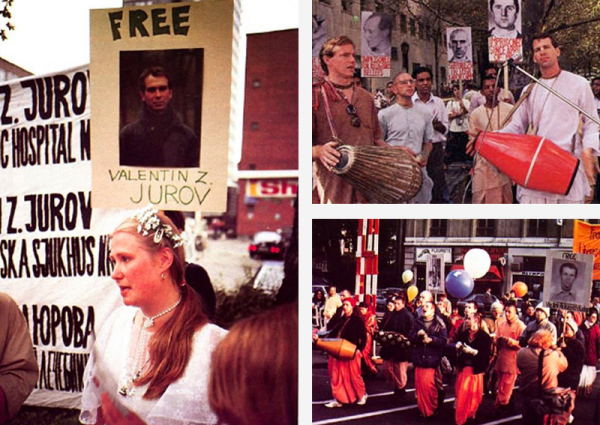 At the November 1986 meeting in Vienna of the Commission of Security and Cooperation in Europe, the international organization that monitors compliance with the human rights provisions of the Helsinki accords, Hare Krishna members again called attention to the plight of imprisoned Soviet devotees. The situation culminated later that year when Sri Prahlada Dasa, then a pre-teen devotee from an ISKCON school in Australia, joined in Kirtiraja’s efforts. He and “The Krishna Kids” recorded an album on the international EMI label, one of the world’s largest record companies. The album included the song “Free the Soviet Krishnas,” a plea to Gorbachev that was also released as a single. Prahlada appeared frequently on television and radio to promote the album and share his concern for the devotees in Russia. 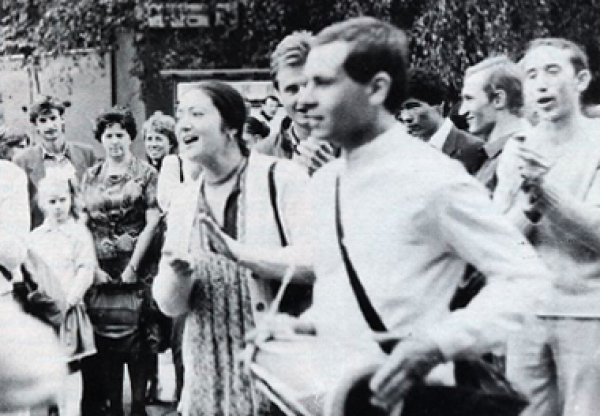 Eventually the devotees were freed, marking a new beginning for religion in the former Soviet Union. Last edited by Pakau; March 27th, 2016 at 08:33 AM. Re: Interestingly Mysterious: How ISKCON got a foothold in Soviet Union? so christians claim to be persecuted by hindu fundamentalists in india but their own fundamentalits do the same to hindus in russia . But nevertheless Anatoly Pinyayev heroic exploits were so riveting, thrilling, exciting etc. I don’t buy it. I think there was a bit of behind-the scene-work by Indian intelligence agencies. They must have identified the young man and indoctrinated him. India’s intelligence agencies must have done this to cement the relationship between India and Soviet Union. And there are instances where Russian authorities 'surprisingly' gave permission to build temple or do something publicly. The reality may be that they must have demanded some bribe and their demands may have been fulfilled. A. C. Bhaktivedanta Swami Prabhupada has been described as a charismatic leader, in the sense used by sociologist Max Weber, as he was successful in acquiring followers in the United States, Europe, India and elsewhere. Your link # 2 gives an impression that it is Conmunists, peaceful guys and Greek Orthodox Priests causing problems for ISKCon. So, only a 3rd are Christian Fundamentalists. A good part of problem seems to be Soviet legacy of repressing religion. In a good part of Christian world, ISKCon or other Hindu temples do not face problems. Long time back when I visited Swaminarayan temple in London, there was a school tour with many gora kids visiting that to 'study Hinduism'. One of the volunteers there was claiming that many Pakistanis also visit that temple. There is a Hare Krishna temple in Soho too, with a big queue for the Prasad. The big question is what happens after London becomes Londonstan. Hooray- Londonstan actually shows up in my iPhone autocorrect. Anatoli Fedorovich Pinyayev (Ananta-santi dasa) was the first Soviet Hare Krsna devotee. Because of his active preaching throughout the USSR and because of the spiritual influence he had on many people, he was subjected to severe persecution for five and a half years at the hands of the staff at various Soviet psychiatric hospitals. The following excerpts are from an interview with him conducted in February 1988. I started preaching Krsna consciousness after Srila Prabhupada visited Moscow in 1971. Gradually people in the Soviet Union became more and more attracted to Krsna consciousness and it became quite widespread. The authorities, however, became afraid because so many from the intelligentsia were interested in Krsna consciousness. Everything spiritual was considered to be criminal and thus they started repressions. It was just like an explosion of Krsna consciousness in the Soviet Union. The authorities were terrified so they tried to discredit the movement and present it as simply a group of crazy criminals. Because I was the first one to preach and the only disciple of Srila Prabhupada, they tried to repress me and present me as a crazy criminal. The court accused my godbrothers and me of teaching vegetarianism, which they said is harmful to the body, and for teaching mantras and praying, which they said is harmful for a person’s mental condition. On this ridiculous pretext they were accusing us. 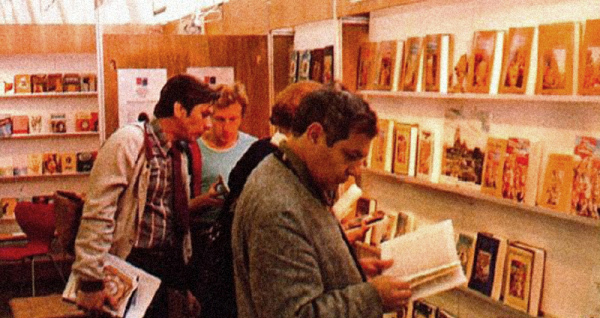 At the Bhaktivedanta Book Trust exhibit at the 1979 Moscow International book Fair, thousands of Russians were introduced to Srila Prabhupada's books. I was imprisoned and they tried to present every person who was following Krsna consciousness in this country as crazy. They then put me in a mental prison, a mental jail. There the doctors said that they were taught that religious believers are insane, and that only insane persons can think that there is a God, that there is spirit, and that we are not these bodies but spiritual sparks. I was given courses of medication for many months. They gave me drugs three times a day. It was so bad that I was only able to lie in bed. This drug was special; it made it impossible to concentrate on anything. If I tried to chant loudly they would give me such large doses that I could have died. Lying on the bed I had so much material discomfort; these drugs make you restless and force you to change the position of your body all the time. I was feeling very weak and so much discomfort. It was just like torture for months and years. The only pause in the torture was when I was sleeping at night. Initially, when the psychiatrists considered me crazy, they brought me from the regular prison to a psychiatric prison in Smolensk. It was on the same site as the ordinary prison but it had special cells for psychiatric prisoners. It had the bad aspects of both a mental asylum and prison. We were living in small cells with about twenty people in each. There was not enough fresh air. We took baths irregularly, sometimes not for 23 days. Many people there had insects on their bodies. The entire place was very dirty. The food was prepared very badly. People there often had their teeth fall out and their gums would bleed. I was taking very little food. Everything was a problem there. Even the janitors where criminals. It was a place for crazy criminals and there was constant fighting amongst them. There was pressure from the doctors, the janitors, the criminals, everyone. Everyone was very much disturbed. My relatives were told that I would never be released. The prisoners were punished for everything. I was trying to wash my clothes and every morning I tried to wash at least parts of my body. But I was punished many times for this. They did not like this. The janitors tried to beat me up several times. There was psychological pressure all the time. Drugs were given for any reason and on any pretext. Somehow or the other the doctors decided I was eligible for release from this special psychiatric prison to a normal psychiatric prison. The KGB did not like this because their aim was to keep me there for my whole life. So instead I was transferred to another special psychiatric prison in the city of Oryol. Everyone in that place was astonished by the fact that I was imprisoned for preaching religion. They saw that the authorities were especially oppressive towards me; they could not understand why. 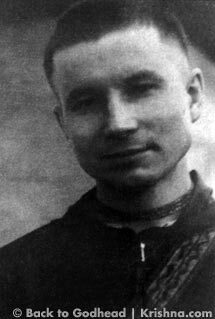 I found out from my mother that my godbrothers all over the world had started a campaign for my release, as well as the release of other imprisoned devotees in the Soviet Union. The situation changed a little. During the last half year in Oryol some changes where expected, so I started to preach more at that time. In Smolensk I was kept in one ward where there was a doctor who was famous for his sadistic inclinations. In Oryol, however, my last doctor told me that I was completely sane. He said he understood that I was in the mental prison because of the political situation. Before “perestroika” every aspect of spiritual and intellectual life was oppressed in our country. He said, “Time is working for you. Because of the changes in our society and because of the help from abroad, sooner or later you will be released.” He was a little compassionate towards me and I preached to him. I was very thankful to my godbrothers and people all over the world who did something to somehow release me. 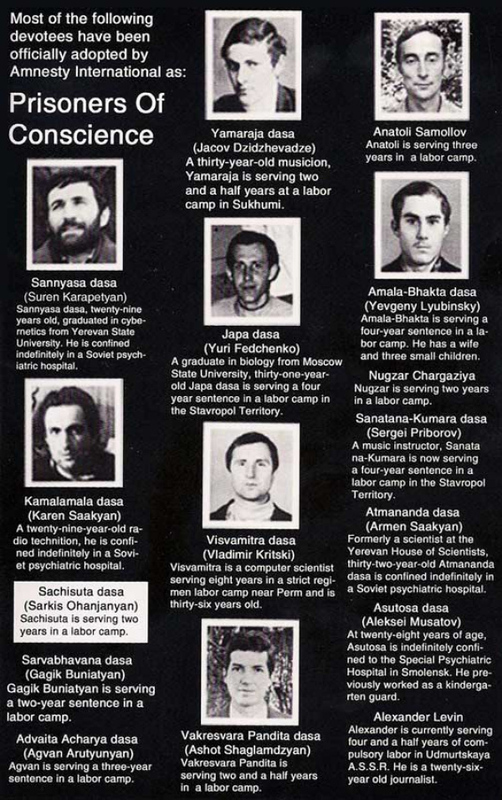 Campaign to free the Soviet Hare Krsna devotees. 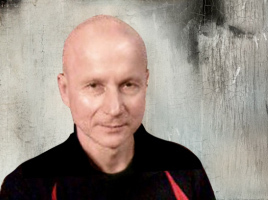 I was released from the Oryol psychiatric prison in a very strange and unusual way. One day my doctor called me in and said he was a little bit agitated. He told me that some papers had come from Moscow saying that I should be released. He said that there would be a special professor coming from Moscow to be part of a medical commission that would release me. Mereko ek baat samajh mey nahi ata. I have seen some youtube videos. Why do some people in former Soviet countries literally do song and dance about Hinduism in open public places? Sharam-varam hai ki nahi? That is nothing. Just minor obstructions. Orthodox Christian priest Andrei Kurayev told The Moscow Times that after a spike in numbers, many Krishna followers are now deserting for Christianity. One example is Dmitry Enteo. After having formerly harbored interests in New Age and Oriental spiritual teachings, the self-proclaimed Christian "missionary" with a track record of public violence now runs the anti-Hinduism and anti-Buddhism website. I wonder how much ISKCON spends on it's conversion missions. Below: Their faces tell that the new converts are happy after receiving the moolah.